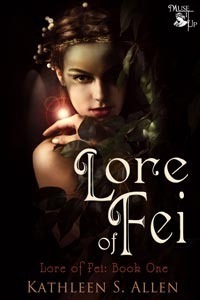 As part of her book tour for Lore of Fei, I have Kathleen S Allen here today with a guest post about faerie magos (magic). When I was writing LORE OF FEI I wanted my faeries to have magical gifts of some sort. I mean, since they have wings they can already fly. But, what other gifts should they have? Ah, glamour. Glamour is unique to faeries. Glamour is defined as: magic or enchantment. Faeries glamour is used to disguise the faerie in some way. This is why humans can’t see faeries, except in certain circumstances, the faeries are using glamour to hide themselves. In LORE OF FEI, I have the faeries using glamour to appear human, without wings or to become shadow-like in order to hide from the humans. My main character, Ariela, is different. She has gifts the other faeries don’t have. Faeries can run so fast they appear to be running on top of the grass or water but Ariela is even faster. Although she belongs to the class of Healer faeries, she has the gifts from each class of faerie, that’s what makes her unique. CORYPHEE FAERIE-Their wings are pale yellow wings almost white in colour. This class of faerie are the creators of art, music, crafts, weaving, and clothing. The humans pay to have a Coryphee make garments for them. When a newborn faerie is born, a Coryphee sings them into the world and makes them a special faerie blanket that usually matches the colour of their wings. The colour of the wings determines what class a faerie will belong to. HEALER FAERIE-They have blue wings. This is the healing class, they can heal both faeries and humans. They act as midwives and tend to the dying. Faeries used to be immortal but are no longer. Healers are allowed in Hege (the human land) to attend to the sick and dying humans. Healers can also weave on looms. COZEN FAERIE-Their wings are in shades of brown. These are the merchants. The Fei faeries sell their products on Market Daeg (day) to the humans. The Cozen are the faeries who interact with the humans to sell faerie products. DREOGAN FAERIE-They have wings in shades of green. This class of faerie are the growers or harvesters of faerie crops. One of the most coveted faerie crops is that of feight. It’s a caffeinated drink grown only in Fei and infused with faerie magos (magic). FORGE FAERIES-Their wings are orange or red, fire-coloured. These are the metalsmiths. They make swords, daggers, jewelry, if it can be forged by a smithy, it can be made by a Forge faerie. Faerie weapons are stronger than human ones and their jewelry sparkles and will never become dull. SHIMMER FAERIES-Their wings are in shades of purple. They are the cooks/chefs of the faerie world. Their meals are coveted by the humans who pay well to have a Shimmer prepare a special meal for them. In Ireland if a child was unlike their parents either in temperament or looks, the child was said to be a changeling. A changeling is a child of the faeries sent to plague humans. Soon after birth the faerie would exchange the human baby for the faerie baby who looked exactly like the human baby. I used this idea at the beginning when the humans believe their human baby was stolen by the faeries. What would your faerie magos be? Ariela is a mutant faerie, born without wings. No wings, means no magic. The Veil of Enclosure that separates the faerie land of Fei from the human land of Hege begins to dissolve. The humans go through the Veil in order to steal the faerie children and enslave them. They clip their wings so the faerie children lose their magic and die soon afterwards. The Faerie Council asks Ariela to go to Hege as a spy to ascertain the human’s plans for Fei. She has to stop the warmongering humans before the faerie children are lost forever and repair the Veil. But, only a silver-winged faerie can repair it and no silver-winged faerie has been born. It is up to Ariela. But, Ariela has no magic, or does she? Great info, I love fairies. Thank you for the giveaway! I like all the different faerie types you made up. I absolutely love to see the different type of stories that are out there for fae and faeries.